Click to viewSure, Batman is cool and all, but he's a work of pure fiction, right? Well, a Canadian scientist and lifelong Batman aficionado has examined the Dark Knight's skills and figured out how regular people could transform themselves into real-life Batmen and Batwomen. There are only six not-so-easy steps to a Bat-enhanced you. Better start training now, because it's going to take about 20 years before you're ready to mete out justice on the mean streets of Gotham City... or Boise. Professor E. Paul Zehr studies kinesiology and neuroscience at the University of Victoria in British Columbia, Canada. His credentials don't end there: he also practices martial arts and has been collecting Batman comics since he was a kid. He examined hundreds of issues of Batman comics, as well as the films, and worked out exactly what skills Batman has and what it would tale to acquire those skills in real life. 1). Train Your Brain - It takes a lot of natural mental acuity to become the World's Greatest Detective, but you can sharpen your thinking skills with practice (and maybe a steady diet of Murder, She Wrote episodes). 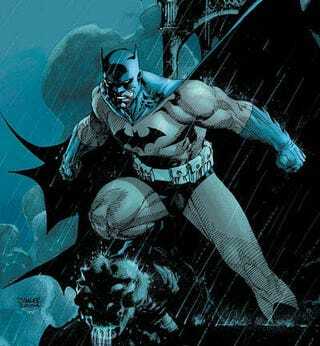 But Batman's fighting skills rely on mental focus as much as physical ability. It would take years of dedicated combat and gymnastic training to develop the innate sense of body position and movement necessary. 2). Train Your Eyes - You'll need great eyesight to pick out details at a crime scene, and a wide field of vision to track multiple opponents in a fight. It's not like the Joker is only going to have a single henchmen. Dr. Zehr suggests working on exercises that can widen your field of peripheral vision and visual focus. 3). Eat Lots of Bread - Dr. Zehr considered Bruce Wayne's activity level and determined that he needs to eat about 4,000 calories per day, mostly carbs. 4). Practice a Lot - All the different situations Batman deals with require a combination of strength and agility that's almost impossible for a human to achieve. You can get one or the other, but gaining both will require a training regimen Dr. Zehr describes as, "even more varied than a decathlete's." 5). Buy Heavy Curtains - To fight crime all night, you'll need to sleep most of the day in a very dark room. Otherwise your body clock will by totally screwed up, like having jet lag 24/7. 6). Punch Wooden Posts - This martial arts technique is used to strengthen the bones that take the brunt of the force when delivering Bat-punches. Might want to throw in some heavy running and jump training, so your ankles don't snap when you drop off a three-story building. All told, Dr. Zehr figures it would take about 20 years of training to accomplish all this (he also discusses some of the technoligical limitations we face in replicating Batman's gadgets), and it will work best if you start during childhood. So what are you waiting for? Image by: DC.